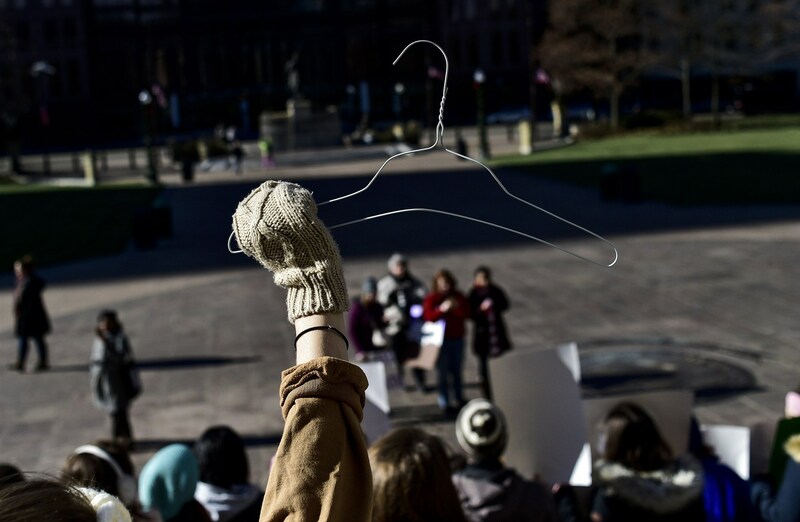 A protester holds a hanger during a demonstration against a proposed bill that bans abortion once a fetal heartbeat is detected in Columbus on Dec. 12, 2018. The bill was passed by members of the Ohio Senate, but outgoing Governor John Kasich has said he would veto the bill. But many legal experts and women’s rights groups say the bill has no chance of surviving in the nation’s highest court — even with the shift in the makeup of Supreme Court justices that President Donald Trump’s conservative nominations have ushered in. Ohio’s so-called heartbeat bill would ban abortions from the moment a heartbeat is detected in a fetus, which can be as early as six weeks into a pregnancy — before some women even know they are pregnant. Its author, president and founder of pro-life network Faith 2 Action Janet Porter first introduced the bill in Ohio in 2011 and has in past years described it as being designed to be the “arrow in the heart of Roe v. Wade,” the 1973 case that legalized abortion nationwide. “The bill itself is one that we believe the Supreme Court is ready for,” Porter told NBC News on Friday. Kasich has indicated he will veto the heartbeat bill. Even if he doesn’t, many say the odds of the bill reaching the Supreme Court, never mind being backed by it, are slim to none. The ACLU has vowed to file a lawsuit immediately challenging the bill’s constitutionality if it is signed into law. “The lower courts will say that the law’s unconstitutional. There’s no wiggle room on that,” he said. But in the meantime, there’s a possibility that the Supreme Court will hear a number of other challenges to Roe v. Wade first, such as Indiana’s ban on abortions for fetal anomalies such as Down Syndrome and Alabama’s proposed prohibition on a second-trimester abortion procedure. “Ohio is obviously doing something radical and unconstitutional, but they’re also doing something that they’re touting as being the case that’s going to overturn Roe v. Wade. But they’re just late to the game here,” Cohen said. Porter, the bill’s author, said the legislation is “crafted in such a way that it actually doesn’t have to bring down” Roe v. Wade but rather changes what marker that the Supreme Court uses for determining life in unborn babies. Currently, Roe v. Wade focuses on fetal viability — accepting conventional medical standards that a fetus becomes viable sometime around the 24th week of pregnancy, and that a fetus’s interests cannot be placed above the desire of the pregnant woman until viability. Carol Sanger, a law professor at Columbia University and the author of “About Abortion: Terminating Pregnancy in 21st Century America,” said states have tried repeatedly to pass legislation that they see as having a chance at overturning Roe v. Wade. She said it was “unlikely” the Supreme Court would take on the Ohio bill and felt legal options that would result in Roe v. Wade being overturned did not exist in this case. Women should be given a chance to choose. We must remember that it is only legal abortion that can be banned. Laws against legal abortion simply drives abortion underground and makes it more dangerous. That’s the way civilized people have always reacted to horrors, Jim. We drive them underground.